Labelle is a towering oasis in downtown Highland Park located in the midst of a resurgence going on with the construction of a new fire department and redevelopment of the area with new business opening up. It was completed in 1973 and this 10 story high rise has 212 units which are broken down into bedrooms and studios apartments. Each floor has their own laundry facility. Age qualification is 55 plus but HUD only allows 10% of the total number of apartments (22) to be rented to the 55 to 61 age range. There is usually a waiting list for that segment. 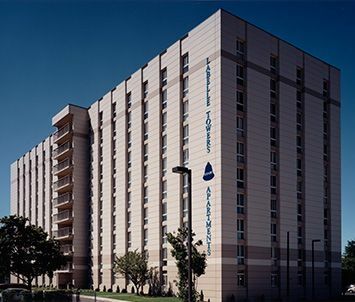 Labelle is nationally recognized as “A Community of Quality “ by the National Affordable Housing Management Association. There are certain criteria that Labelle had to meet to be recognized by this national award. The co-op was set up to be democratically run by the members that live there. This means that there are elections held every year for officers, floor reps, financial issues. Labelle and all of the buildings managed by CSI Support and Development Services (58) are run the same way. The members enjoy floor parties, holiday parties, bingo, movie nights. There are shopping and casino trips. They sometimes host other of our buildings or travel to them to play cards. There is a van to transport them to other functions. We are 500 feet from Woodward Avenue and Manchester. Within walking distances there are banks, strip malls, grocery stores and a police mini station. Our members volunteer to sit at the front desk to ask visitors, vendors and medical personnel to sign into the building. Also from 7p.m. to 7a.m. there is a paid security force. There is gated parking in the rear of the building. Rent is based on a percentage of the household's income. If you’d like to see available apartments, both studio and 1 bedroom, please feel free to stop in or call one of the contact numbers listed at the right. LaBelle Towers Co-op is proud to be recognized as a NAHMA Communities of Quality Corporate Partner. This designation is for multifamily properties that have achieved a high standard of excellence in the way they are managed, the services they provide residents, the experience and training of personnel, and other criteria.